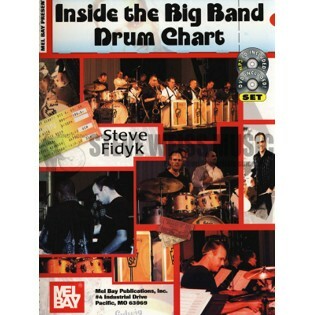 Inside the Big Band Drum Chart is a first of its kind drum method that uses traditional and contemporary arrangements performed by a 17 piece jazz ensemble as the vehicle to study beats, musical form, ensemble phrasing, articulation, and interpretation. For each arrangement, there is "talk through" information explaining how the composition is played as well as transcriptions of key beats and melodic information that connects the "written drum part" to the music. The 248 page book includes a 2.5 hour MP3 CD and an hour long DVD demonstrating every exercise in the text. Also included are anecdotes and interviews with legendary big band drummers and arrangers such as Louie Bellson, Jake Hanna, Phil Wilson, Mark Taylor and Bob Curnow.